Back on Dec 20th, we banged the table for loading up on Apple as it sold off. That trade is on track but we would like to lock in recent market gains. A look at hedges we can use for the Dow and the S&P 500. 25,000 is up 2.88% from 24,300 and the 2.5% line is 24,907.50 though really the main support line for the Dow is 24,000 (8,000, 16,000, 24,000...) so it's more like a 1,000-point rally since mid-Jan and that means we can expect to see a 200-point pullback (weak) to 23,800 and, at $5 per point per contract - that's a $1,000 per contract upside potential vs losing maybe $50 if /YM pops over 25,010 and stops you out. I certainly like the risk/reward on the play - which is how we like to play the Futures. 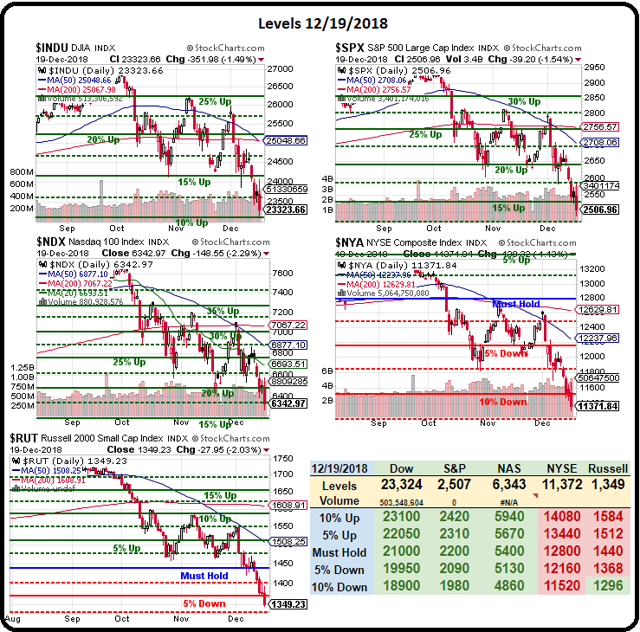 As you can see from our color-coding, we're at a very dangerous inflection point as those lows may begin to turn red and then we can begin to calculate the 20% drop lines, rather than the bounce lines, for our next set of targets. Those are Dow 21,600 (not far), S&P 2,360, Nasdaq 6,160, NYSE 10,560 and Russell 1,400 so we're already more than 20% down on the Russell and it's down 350 so a 70-point overshoot (1,330) is not a big deal but lower than that, with another index crossing below 20% - THAT would be a very negative sign! 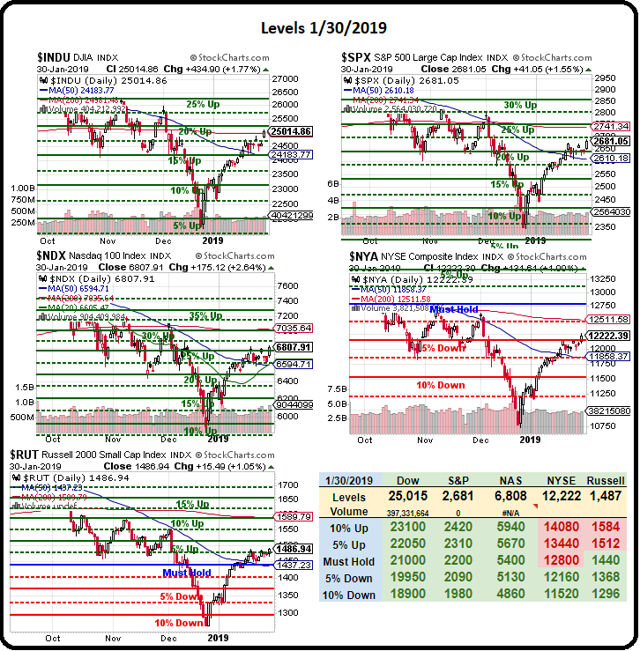 We did hit those 20% correction lines but, other than the Russell, we've made our strong bounce targets so now we revert back to our non-panic levels and raise our expectations slightly in the hopes of seeing a true recovery (all bounce lines green, no backsies). Yesterday's surge was nice, but not quite enough and, if that's all earnings has to give us, we'll be very nervous with our now, very bullish portfolios (we pulled our hedges at the -20% mark, anticipating this bounce. As I said on Money Talk last night, we finally punched over our strong bounce lines due to a stunning turnaround by the Fed, who wiped out talk of another 1% in rate hikes for 2019 and even walked back $1Tn of balance sheet adjustments that were anticipated. If this is all we can accomplish off that massive does of stimulus - look out below! We also discussed the IBM (IBM) and Caterpillar (CAT) but, more importantly, we bumped up the TZA hedge to add a bit of protection and that's something we should be doing with all of our portfolios (adding protection), and, as a new hedge, we should consider the Dow and the S&P because they are both $15,000 off their lows - in the Futures - and we already shorted /YM at 25,000 but let's see if we can match that with an option spread. As I said on TV last night, the short CAT 2021 $100 puts, even at $8 are essentially free money. You are promising to buy Caterpillar for $100 and being given $8 in exchange for that promise and CAT is at $130 so 23% off just to get to $100 and you are netting in for $92, which is 29% off. But, since we want to use the $8 we collect, call it a $130 net entry. The net cost of this spread is $800 in cash and about $5,000 in ordinary margin would be required for the short puts and the DXD spread would pay $20,000 at $35 or higher, which is only half of where we topped out in December. Ignoring the fact that the point is to protect the rest of your portfolio, if the market did tank and you ended up buying 500 shares of CAT for $100 ($50,000) plus the $800 you paid for this spread, you get back $20,000 and your net cost is $30,800 or $61.60 per share of CAT - seems pretty good to me! AAPL is still cheap enough for us to want to sell puts and you can collect $11 for each 2021 $140 put you wish to sell for a net $129 entry. I'll bet you wish you bought AAPL for $129 on the dip we just had only it never went that low, $142 was the Jan 3rd low - it only seemed like it went lower the way people were freaking out about it! Here we're netting into the $25,000 spread for $2,000 so the upside protection is $23,000 and our worst case is owning 500 shares of AAPL for $140 + $4 ($2,000/500) that we paid for the spread so $144 - but that's assuming AAPL goes down and the Nasdaq stays up - so very, very unlikely! Apple is volatile so the ordinary margin requirement on the short puts is $7,000 but they are past earnings and the volatility should ease off shortly. We are, of course, worried about the Trade Talks with China and Factory Activity in China's PMI contracted at 49.5 (below 50 is contraction), it's weakest level in 28 years and that's now two months in a row of negative movement. If the two sides cannot reach an agreement by March 1st, Trump has said he will increase the tariff rate from 10% to 25% on Chinese goods worth an estimated $200bn and, sadly. I have said before, these are not the kind of headlines we should be seeing if the markets are heading back to all-time highs. These are the headlines of a 20% correction that isn't going away, even with the most recent round of Fed stimulus so we'll take our hedges - and it looks like our /YM shorts should hit our primary target this morning (+$1,000/contract). Then we'll look 200 points lower for the next leg of the retracement if 24,800 fails to hold. See - we have fun no matter what! Disclosure: I am/we are long AAPL, BA, SDS, DXD, IBM, CAT. I wrote this article myself, and it expresses my own opinions. I am not receiving compensation for it. I have no business relationship with any company whose stock is mentioned in this article.